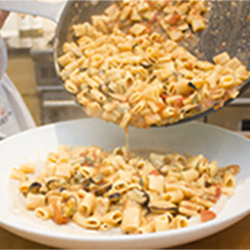 What can you ask more than a dish of pasta prepared by an Italian from Calabria? 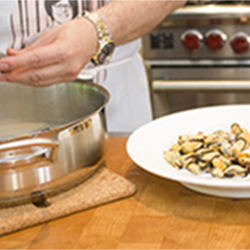 Here is another fabulous recipe made by Pino, with fresh mussels in a tomato, mussel broth, garlic and cannellini bean sauce. 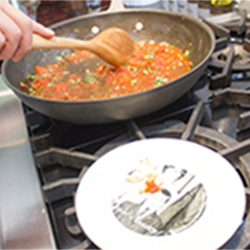 You will be surprised by his way to prepare this amazing dish that, I’m sure you will savour with passion! 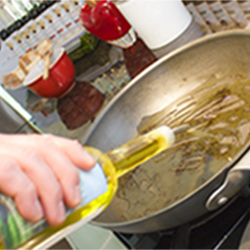 In a large pan, heat some olive oil over medium heat mince onion and add to pan with 1 smashed garlic clove, cook 2 to 3 minutes. 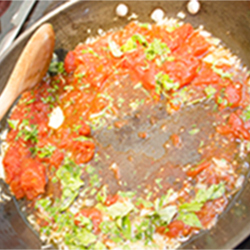 Add tomatoes and juice to pan; break the tomatoes with a fork or spoon. Add basil leaves and cook 3 to 4 minutes over medium heat. Remove from heat and set aside. 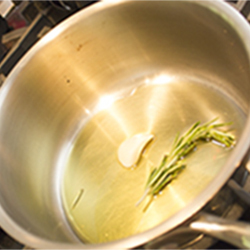 In a medium saucepan, heat some olive oil over medium heat, add rosemary, 1 smashed garlic clove and cook 1 minute. 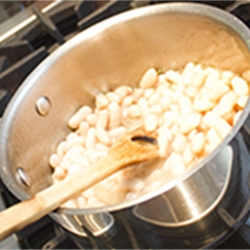 Add cannellini beans with juices and cook about 10 minutes. Remove garlic and rosemary. 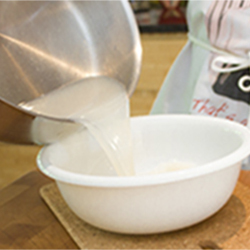 Transform the beans into a purée using a hand blender. Remove fron heat, cover and set aside. 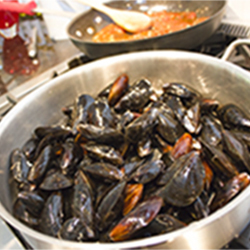 In a big pan, add mussels, cook with cover over medium heat for 5 to 7 minutes or until the shell opens. 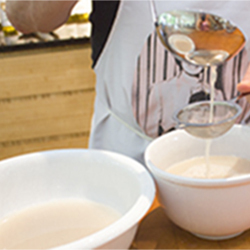 Extract mussels from the shell and place in a plate. 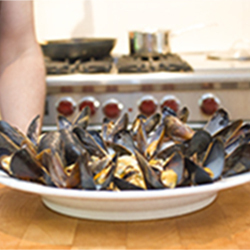 Keep about 20 mussels in their shell, in another plate for presentation. Transfer the mussels cooking juices in a bowl. Filter. 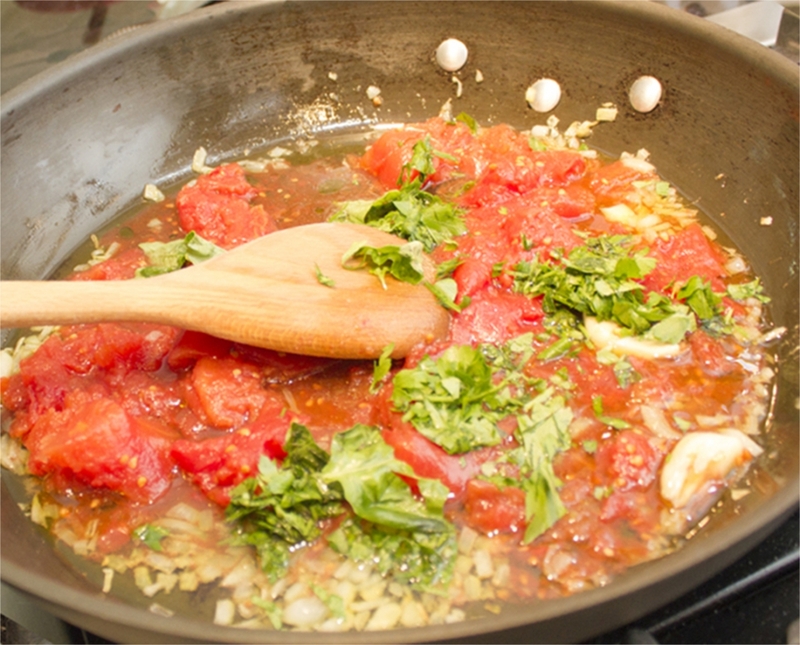 Add the juice to the pan with tomatoes, set heat to medium. 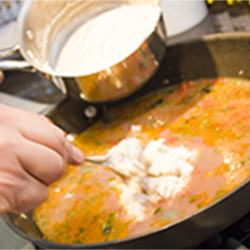 Add about half the cannellini bean purée to your sauce and mix well with a fork. 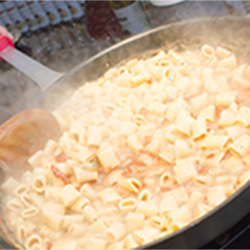 Bring to boil, when preparation is boiling, add pasta (mezze-rigatoni) and cook 4 to 7 minutes or depending on instructions on the pasta box. 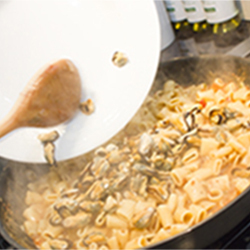 When “al dente”, add mussels, mix and cook another 2 minutes. 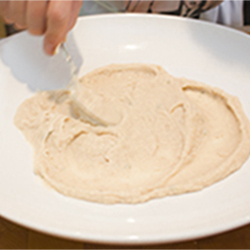 Meanwhile in a big serving bowl, spread the rest of the cannellini beans purée. 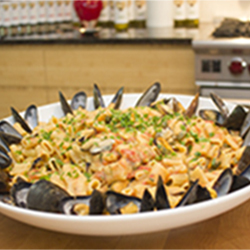 Add pasta preparation and garnish with mussels in their shell and fresh parsley, serve and enjoy! 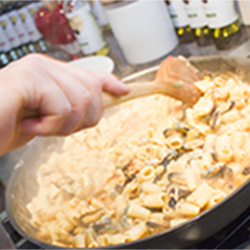 Flavour tip Instead of using a pan with boiling salted water, Pino cooks his pasta directly in his sauce, which gives more flavour to the preparation. 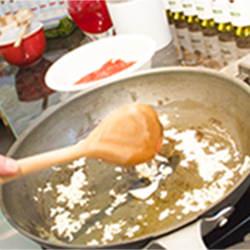 Pino's tip A good way to thinking your sauces is using a bean purée, it also give more taste! 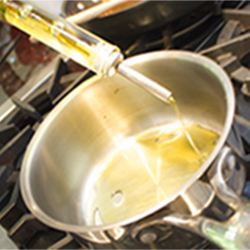 2 - In a large pan, heat some olive oil over medium heat. 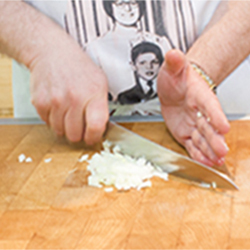 3 - Add onion and 1 garlic clove, cook 2 to 3 minutes. 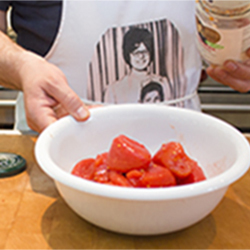 4 - Add tomatoes in a bowl with the juice. 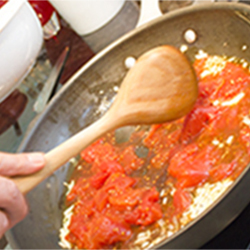 5 - Add tomatoes and juice to the pan; break the tomatoes with a fork or spoon. 6 - Add basil leaves. 7 - Cook 3 to 4 minutes over medium heat. Put heat off, set aside. 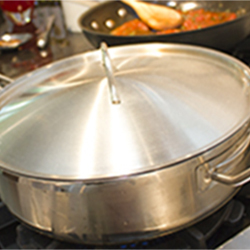 8 - In a medium saucepan, heat some olive oil over medium heat. 9 - Add rosemary and a garlic clove. Cook 1 minute. 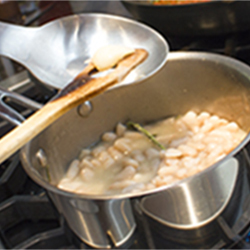 10 - Add cannellini beans with juices. Cook about 10 minutes. 11 - Remove garlic and rosemary. 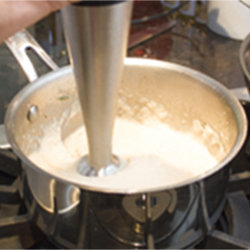 12 - Transform the beans into a purée using a hand blender. Put heat off, cover and set aside. 14 - Cover and cook over medium heat. 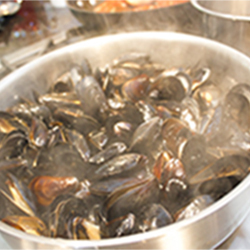 16 - Extract mussels from the shell and place in a plate. 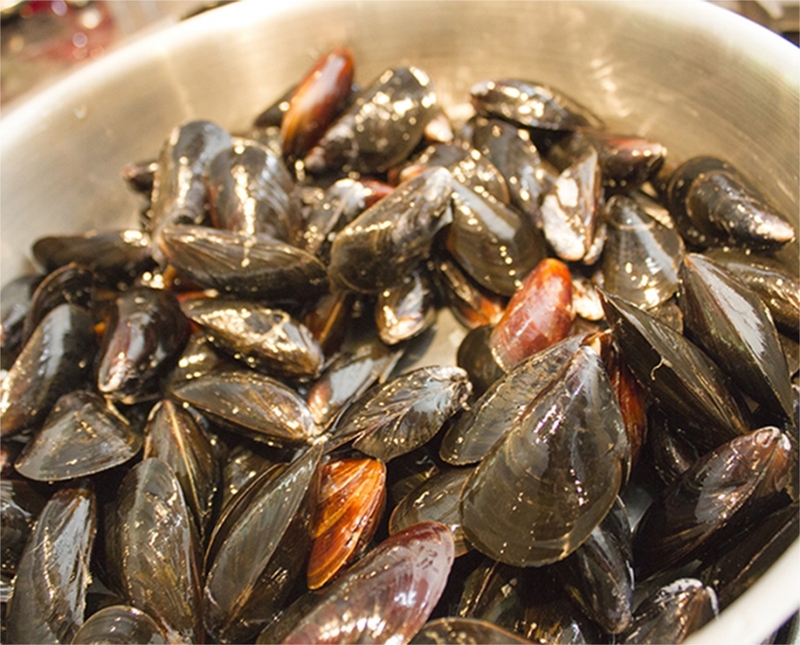 17 - Keep about 20 mussels in their shell, in another plate for presentation. 18 - Transfer the mussels cooking juices in a bowl. 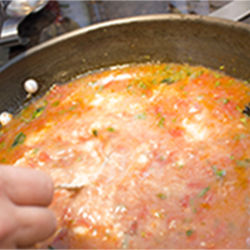 20 - Add the juice to the pan with tomatoes, set heat to medium. 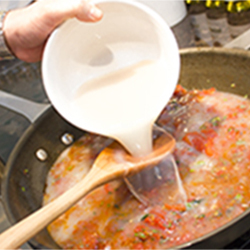 21 - Add about half the cannellini bean purée to your sauce. 22 - Mix well with a fork. Bring to boil. 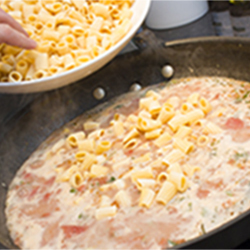 23 - When preparation is boiling, add the pasta (mezzo-rigatoni). 24 - Cook 4 to 7 minutes, follow instructions on the pasta box. 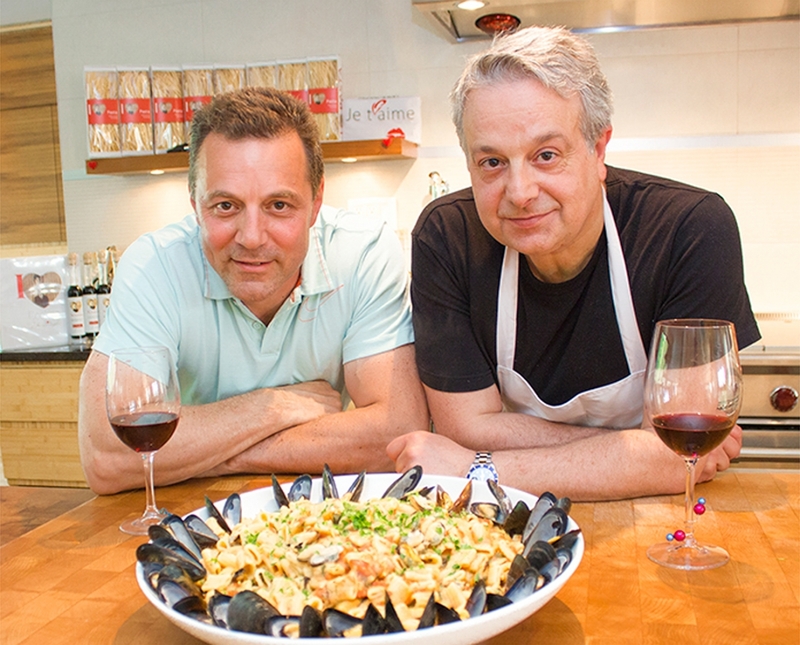 25 - When “al dente”, add mussels. 26 - Mix and cook another 2 minutes. 27 - In the meantime in a big bowl, spread the rest of the cannellini bean purée. 28 - Add pasta preparation. 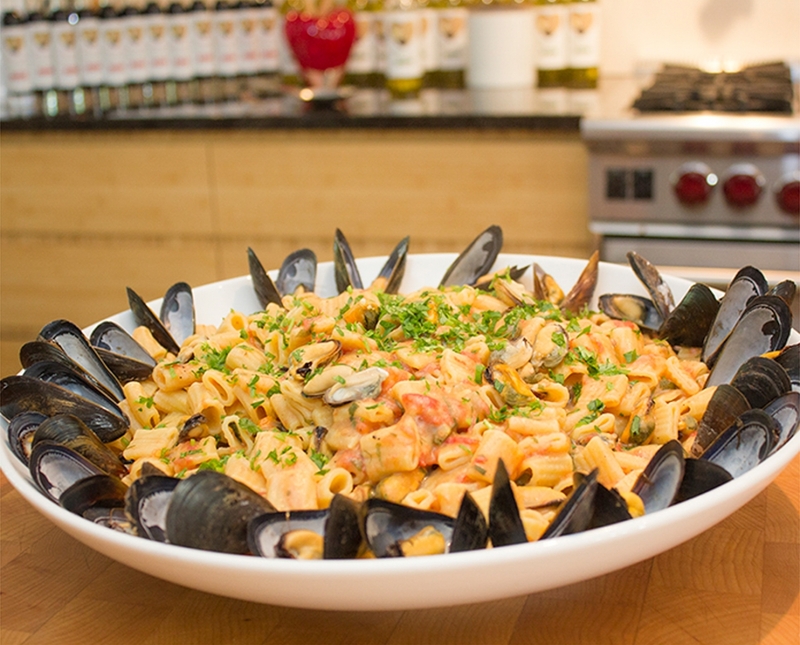 29 - Decorate with mussels in their shell and fresh parsley, serve and enjoy this pure delight!